Getting the right visibility into how products are performing at the shelf depends on how brands collect in-store data. In this blog, we look at the state of in-store data collection and retail audits in the CPG industry, and what methods can improve the “shelf health” of brands. Consumer packaged goods (CPG) companies today are under enormous pressure to optimize their in-store execution to drive sales. This means understanding in-store conditions and applying this knowledge of the shelf to make sound merchandising and marketing decisions. Each of these factors affects the success of brands in the retail environment and their overall “shelf health”. So how does the CPG industry monitor shelf health? Data is only as good as the method of collecting it. In the Trax CPG Shelf Health Survey 2018, we interviewed over 300 senior CPG executives across China, Australia, Brazil, USA and the UK to understand their retail execution practices, including their methods for collecting field data, their challenges with in-store execution and their interest in exploring new solutions to gain better visibility into store conditions. We found that their methods of collecting field data varied widely in terms of their sophistication and the use of technology. 43% of respondents said they rely on supply chain data in the form of scanner data, invoices and orders, to understand how their products are performing at shelf. While this method presents a picture of how well products are selling, it doesn’t account for factors in the store influencing sales. For example, how many facings do competing brands have on the shelf? Were your products at the right location on the shelf? The most common method of collecting field data involves a manual retail audits, with 44 percent of respondents claiming they follow this approach. In this method, field sales teams or third-party brokers and merchandisers visit the stores in person and take stock of the shelf conditions by moving from aisle to aisle. Documenting this information is either paper-based or involves smartphones and tablet devices with in-built survey forms and questionnaires. Sometimes, these sales force automation tools provide the option of capturing images of the shelves. While this helps verify whether the selected stores are audited, without any image recognition and automation software, it still involves a lot of time and effort, both in taking the photos and in documenting and scoring the images. A further 31% of respondents also claimed to purchase syndicated store observation data, which is also quite often generated from manual audits as detailed above. At the top end of the technology adoption curve are computer vision (CV)-powered solutions which automate the collection of in-store data. Images of the shelf captured using smartphones are analyzed and individual SKUs identified to deliver reports in near real time for corrective actions and strategic decisions. 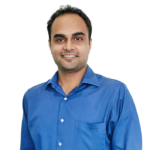 Depending on the level of accuracy, completeness and sophistication of the machine learning engines, such solutions can also digitize the entire shelf to give brands competitive visibility, with valuable metrics like linear share of shelf and fair share of shelf. Some leading manufacturers are already adopting such advanced technologies. 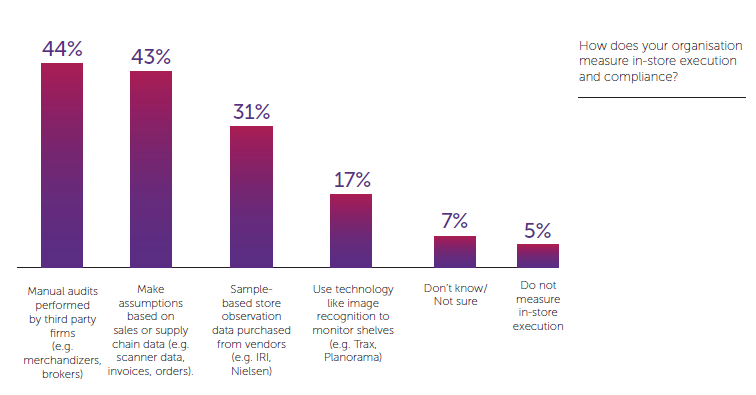 Our survey found that 17% of respondents use image recognition technology to monitor shelf conditions. And those who do are already reaping the benefits. Henkel, the global beauty care brand used Trax Retail Execution to reduce data collection and merchandising execution time for their sales reps by 50 percent, allowing them 150 percent more time for active selling. The end result of this was a 2 percent uplift in revenue for the brand in just 3.5 months. For more insights from the survey, along with use cases and perspectives from brands doing retail execution right, download the report, Perfecting In-store Execution.